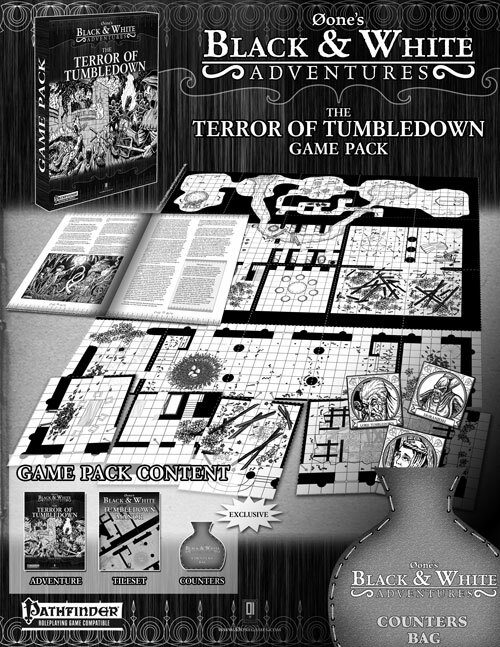 • 28 pages adventure: “The Terror of Tumbledown” is a Pathfinder Roleplaying Game compatible scenario for 5th-level player characters, written by Willie Walsh and illustrated by Bradley McDevitt and Gerry Swanson. The adventure makes a stiff challenge especially in its final encounters, and it introduces three new dangerous monsters. It is set in a partially ruined and seemingly abandoned manor house in a bleak semi-wilderness location that has an evil reputation. • 25 customizable tiles: 0one's Black & White: Tumbledown Manor original product. • 19 counters and paper bag (exclusive of this game pack): counters detailing the major NPCs and foes of the adventure plus an exclusive paper bag to store them. This game pack contains all you need (apart from players and ..